A Warning: This thread isn't for anyone who has a fear of spiders or bugs in general. So, I was brushing mah teeth the other night at about 2 in the morning. I should probably explain that in my dorm the sink is separate from the rest of the bathroom, which is in another room. As I brush my teeth, I turn around, and what do I see? Oh, nothing. Just a Giant cave spider. Naturally, my first reaction is to take a picture of it. 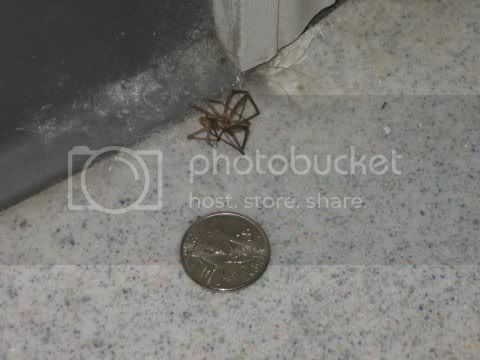 My second reaction is to put a quarter next to it for scale. 2. Stomp or smash with a shoe. Neither of these methods will work in this case. 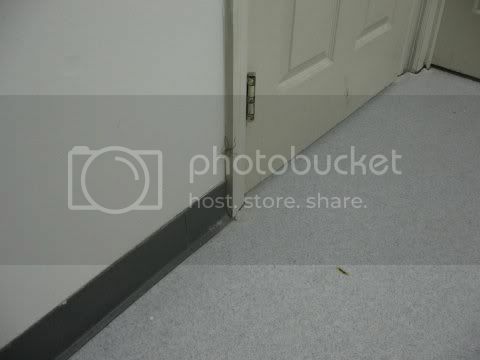 I couldn't get a clean kill with the shoe, as the spider is protected by the frame of the door. Can't go for the grab and squish method, as I'm not putting my hand anywhere near that thing. So seeing as this all happened sometime just after 2 in the morning, I did the sensible thing. I grabbed my umbrella and stabbed the little beast with the metal tip. This may not seem like enough of a subject for it's own topic, but I've had other giant cave bugs running around in my room, and I expect to do battle again. Lets hope this turns into an epic battle. So how many experience points did you earn? Did it leave any nice drops? If you take twenty giant cave spider carcasses to the poacher in town, he can make you some nice armor. 15 exp. And it left a leg stuck to the wall, if that counts as a drop. Find a collector who will trade you spider legs for a new weapon. That thing would scare the piss out of me. I'd just put it under a glass and come back to a dead and perfectly preserved spider in the morning, or CRYOGENICALLY FREEZE IT! How close are you now to level up? Be sure to change the thread title as nessicary to keep a running tally. That spider is probably grey to him, he wouldn't get any experience. 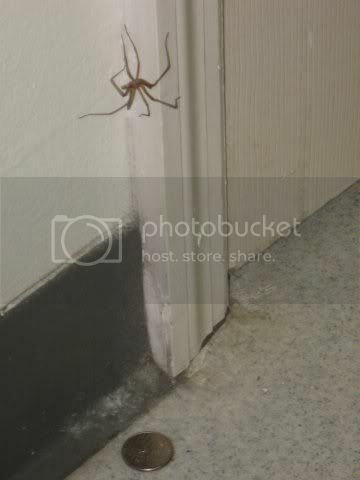 Next one you see, capture it then take it to the nearest spider farm so you can make Anti-Venom. Seems like the perfect lvl. 1 RPG weapon. Ah, yes. Use them for this quest. Don't worry, I'll keep a running tally. Dorms are very similar to caves. I don't know if it was poisonous or not, I should try to look it up. I had to kill it. Catch and release wasn't an option because, as I said, I wasn't putting my hand near it, and I wasn't about to go to bed knowing that that thing was crawling around my room. I bet you wish you took that base level in necromantic raising now. Undead giant cave spiders have their uses.